The Virtual Avebury project will be holding a showcase afternoon between 14:00 – 16:00 on 3 October 2018 in room F202. Staff and students are welcome to come along, don a virtual reality headset and hand-held touch devices, and experience how Avebury Henge, Wiltshire, might have looked and sounded around 2,300 BCE. You can walk and fly around the stone circles, wander around the larger landscape and meet other visitors there in real time. The full description of the project, funded under the AHRC/EPSRC Immersive Partnerships call, is available on our website. We’ll have posters and information at the showcase afternoon with the latest results from our analysis of public participation which took place on 45 days between June-September at The Barn Gallery of the Alexander Keiller Museum at Avebury. 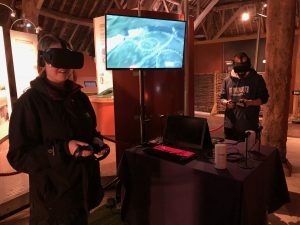 More than 650 visitors to Avebury tried the experience and we captured detailed feedback from 400 of them, evaluating the demographic distribution of users and their responses to a range of questions regarding their experiences of Virtual Avebury. So come along on the 3 October to experience Virtual Avebury for yourself, meet the research team, help yourself to tea and cake and peruse some of our findings. To find out more about Avebury, visit the National Trust Avebury website.